This production represents the highest level of achievement in the art of re-creating the music from classic, historic piano solo recordings to 21st century audio clarity. 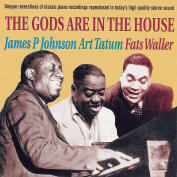 Its basis is the unique work of John Farrell, who has transcribed the music of James P Johnson, Art Tatum and Fats Waller to modern piano rolls using a technique that overcomes the difficulties of transferring a piano solo recording to a piano roll while still retaining the precise style and spirit of the original performance. The excitement of hearing these re-vitalised recordings is an experience not to be missed and gives everyone the opportunity of experiencing the excitement of being there when "The Gods Are In The House"!